Minnesota’s North Shore starts here! Our Duluth MN Hotel offers 116 upscale units in Duluth’s Canal Park. 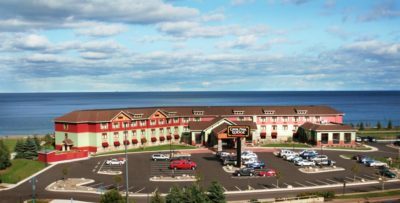 This Lakeshore Duluth Hotel features 100% smoke free guest rooms and meeting space, overlooking beautiful Lake Superior on one side, and is the gateway to the famous Canal Park on the other. Canal Park Lodge also provides easy access to the downtown area and the Lake Walk, with miles of scenic walking, running, or biking giving you a truly scenic view of the Duluth MN area. Great dining and shopping, the famous Grandma’s restaurants are nearby, a timeless and local Duluth favorite. The Canal Park Brewing Company is located right next door for convenient dining and the best pint of beer in the Twin Ports. We also feature an impressive lobby, complimentary hot breakfast, and a unique pool area. Enjoy a remarkable view of Duluth from one of our balcony suites. Our hotel is situated in the heart of Canal Park and at the end of the chain of hotels along Lake Superior, to offer you maximum comfort and privacy. We also offer great accommodations for groups or conferences in Duluth with meeting space, and food catered by Bellisio’s & Grandmas Restaurants. Canal Park Lodge in Duluth MN is a must see and a must stay. Come experience the best of Canal Park here at Canal Park Lodge. Located on the shores of Lake Superior in the heart of Canal Park, the Comfort Suites® Canal Park hotel in Duluth, MN caters to both business travelers and those on vacation. Make sure not to miss the Bayfront Blues Festival—one of the largest annual outdoor music events in the upper Midwest—that takes place in early August. And remember that you can earn rewards, including free nights and gift cards, with the Choice Privileges® Rewards program when you stay at our spacious suite hotel in Duluth, MN. Funding for this conference was made possible (in part) by the Assistant Secretary for Preparedness and Response (ASPR). The views expressed in written materials or publications and by speakers and moderators do not necessarily reflect the official policies of the Department of Health and Human Services, nor does the mention of trade names, commercial practices, or organization imply endorsement by the U.S. Government.